Decimals worksheets are a great tool for students that need extra practise with this tricky maths concept. Our free printable decimal worksheets allow students to practise working with numbers with decimals independently and at their own pace. These decimals worksheets include both standard maths worksheets and game worksheets. All decimals worksheets feature beautiful illustrations and clear instructions to help kids understand concepts easily. Help your child take education beyond the classroom with these decimals worksheets! Daily life requires estimating. Teach your child to round decimals and fractions up or down to the nearest whole number. Use the number line to decipher the hidden message! Fill in the blanks to this number line with fractions and decimals. Practise rounding decimals and comparing their value with a supplemental worksheet. Get a thorough explanation of sales tax, and practise with some fun kids' products. This worksheet reviews maths concepts like rounding decimals and comparing using greater than, less than, and equal to symbols. Looking for a worksheet to help your kid practise determining place value? 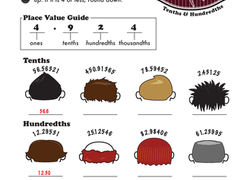 This printable is great for working with decimal places. Exercise your maths brain to fill in these incomplete number lines with all the missing fractions and decimals -- and that's just the beginning! Decimals got you down in the dumps? Get your student in gear for maths with this decimal worksheet. Take brain teasers to the next level with this extra-challenging magic square puzzle that features decimals! Kids add, subtract, compare, and order decimals to the hundredths place. Rounding decimals is important for getting through year 5 maths. If your kid doesn't get it, give him this worksheet from the baseball maths series. Use these blank models for a variety of maths exercises, including multiplying decimals. Give your fourth grader's maths skills a hand with our decimal worksheet. 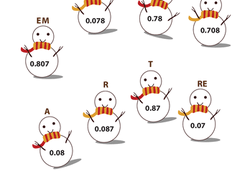 Snowmen keep him company as he practices ordering decimal numbers from big to small. This rounding worksheet works on rounding to the nearest ten cents. After conquering this worksheet, your kid will be a money-rounding rock star! Encourage your fifth grader to tackle this concept by practising rounding decimals to the nearest tenths, hundredths, and thousandths. Does your fourth grader need help with ordering decimals? 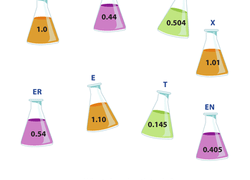 Bolster his decimal understanding with this beaker-booked worksheet. Practise using a number line to round decimals to the nearest whole number, hundredth, and thousandth place. Check your students’ mastery of year five concepts surrounding decimals!